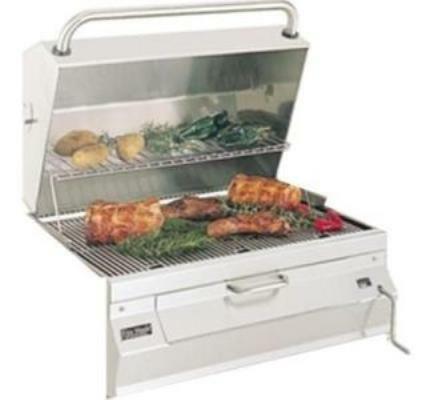 The Smoker Grill has vents in the sides of the lid to allow smoking as WELL as charcoal cooking! This grill offers a true 30" across the cooking surface, not the FRAME of the grill like others measure. The total cooking area is approximately 540 sq. inches. The grill also has a high dome lid to accomodate larger pieces of meat. Every Firemagic Charcoal Barbecue includes easy temperature control by literally turning the front-mounted crank to raise and lower the fire. These charcoal units allow you to match up Firemagic gas unit accessories for your complete outdoor kitchen or cooking package. All offered by a company that has been building outdoor barbecues for almost 50 years! You know they will be here tomorrow. All Firemagic grills are high BTU and should only be used in Non-combustible cabinets. The cut out dimensions for the 30" Smoker charcoal grill are 32 1/4"W, 19 3/4"D and 12"H. Should your cabinet be constructed from wood or any other combustible material, please see the available insulating liner that should be purchased for your application. Please note that the cut out dimensions will be different. Building Plans Complete.